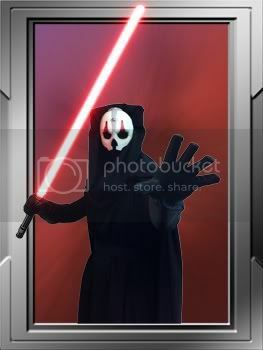 Please show your respect for our newest Sith Lord to the garrison, SL-6300 Darth Nihilus (Kotor). Great work J on your costume, it really suits you. He can party like he owns the Dark Side. Nice work Cutter! you look AWESOME! Congrats J. Now I don't have to hurt you. Another Dark Lord to cause trouble, well, step out of line and you'll be another bounty for me to collect.